Kirk Bell June 20, 2016 Comment Now! Bentley says every car it builds is a blend of luxury and performance, with the Mulsanne taking the luxury ideal to the company's furthest extreme. Well, if you're going to go to extremes, you might as well go big, and for the 2017 model year Bentley is adding more luxury to its biggest, cushiest, most expensive car. Bentley says the 2017 Mulsanne represents a "step change" in refinement and ride comfort over the car it replaces, and it comes in the form of cabin and noise abatement improvements, a stronger structure, and the addition of an Extended Wheelbase model with a wealth of amenities to spoil rear seat passengers. The Extended Wheelbase joins the base model, called Signature, and the more performance-oriented Mulsanne Speed. 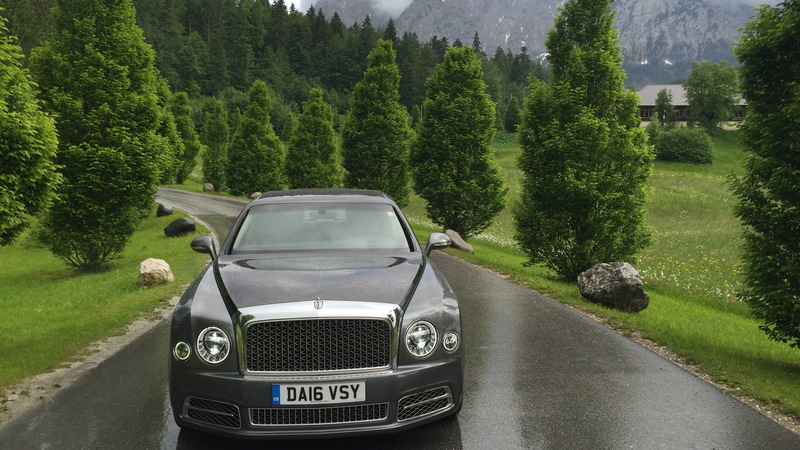 To show off the merits of its new Mulsanne, Bentley invited Motor Authority to Innsbruck, Austria, to experience all three models in the picturesque setting of the Austrian Alps. 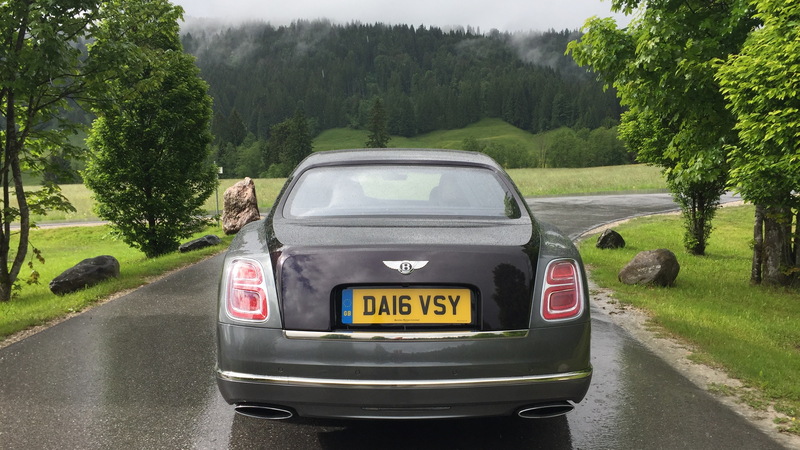 Given the company's claim that the Mulsanne employs everything it knows about building the world’s most powerful, most luxurious cars, we were happy to take Bentley up on its offer. The Mulsanne replaced the Azure in 2010 as a 2011 model, using a new, dedicated, rear-drive architecture. The 2017 changes are the most extensive since it was released. With the addition of the Extended Wheelbase model, Bentley engineers employed several measures to stiffen the body to deliver the kind of ride and performance the company expects of its flagship. Most of the changes were at the rear subframe. The crossmember closest to it was thickened and longitudinal shear plates were added in the same area. The local dynamic stiffness of the subframe mounts was also strengthened and so were the suspension mounting points. Finally and only for the Extended Wheelbase body style, the lower door sills were fortified. But that's not all that was done to make the Mulsanne ride and handle better. Bentley increased the air capacity of the air spring suspension and made it operate more efficiently, both of which allow the springs to react quicker. More substantial rear control arm bushings were installed, and new hydraulic bushings were used on the rear subframe. Bentley says these measures cut rear end noise by four decibels, reducing rumbling noises best. That meant the tires also had to get quieter and Bentley used an innovative tire sound absorption technology inside the tires to reduce tire noise by 50 percent. Active engine mounts were also added to produce out-of-phase vibrations into the structure and therefore reduce noise by another 15 decibels. In addition to the air spring suspension, every Mulsanne comes with adjustable shocks, with a choice of three settings: Bentley, Comfort, and Sport. Those modes also adjust the throttle mapping and the shift points of the ZF 8-speed automatic transmission. 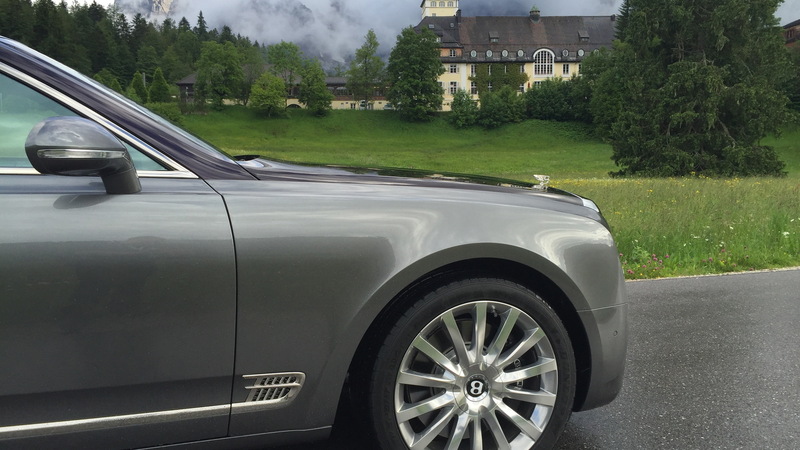 Setting off from the Schloss Elmau Luxury Spa Retreat and Cultural Hideaway (read: hotel), my Bavarian adventure began in the Mulsanne Speed. The Speed sits 0.4 inch lower than other Mulsannes, its dampers have a firmer setting in Sport mode, and it comes with carbon ceramic brakes. With 530 horsepower, it's twin-turbocharged 6.75-liter V-8 makes 25 more horsepower and 59 more pound-feet of torque than the other Mulsannes. 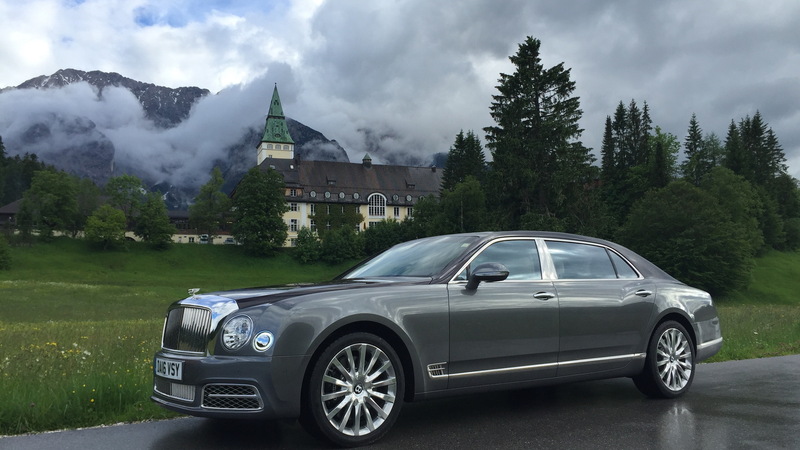 On the road, the Mulsanne Speed proved to be controlled luxury. This is a 5,900-pound car, but it handles like it weighs about a thousand pounds less (which would still be heavy). While it's weight wants to turn every corner into a straight line, its air suspension and adjustable shocks strain against the laws of physics to put the car where you point it. There is some lean in corners, but it's limited and the car responds with surprising agility. The engine is wholly unique. It's a twin-turbocharged, low-revving, long stroking V-8 that wafts the car forward with waves of grunt. Power starts mildly but builds quickly like a crashing wave. The redline is a mere 4,500 rpm, but it delivers so much power down so early that you will think you are over-revving at 3,500 rpm, and you will certainly be going extra-legal speeds when you get there. In fact, the V-8 pushes only about 2,200 rpm at 90 mph. This is an effortless engine that vaults the Mulsanne Speed to 60 mph in just 4.8 seconds and pushes it all the way to a 190 mph top speed. I managed 150 mph on the Austrian autobahn and the car remained rock solid stable. The Speed's Comfort delivers the same suspension settings as in other two models, and the result is a pillow-soft ride. Even in the Sport mode and even with 21-inch tires, the Mulsanne Speed still manages to soak up bumps like a well heeled investor cornering the pork belly market. In the other two models, the Signature and the Extended Wheelbase, the ride is always glass smooth, but the handling is less controlled. It took just one corner in the Signature to show that it is subject to a lot of body lean. A few bumps and dips revealed some float as well, and I found I'd rather slow the pace than dice it up through Austrian mountain roads. Based on vehicle dynamics alone, were I in this market, I'd take the extra $30,000 out of my trust fund to move up to the Speed. The Extended Wheelbase's extra 9.8 inches of rear legroom makes it another strong candidate as the Mulsanne to choose. Bentley developed several rear seat options to pamper rear occupants, and made several other improvements to the interior, as well. Most notably, the seats were redesigned and the infotainment system was completely revamped. This all pays off in a cabin that inspires a sense of occasion. The interior is whisper quiet, interrupted by the winsome roar of the V-8 only when it is pushed. Bentley says material integrity is paramount, and that is quite evident when you get inside and touch the surfaces. Every material in the Mulsanne is authentic. If it looks like wood, it's wood covered with more wood. If it looks like leather, it's the finest hand-cut leather. If it looks like metal, it's polished and knurled stainless steel. If it's clear switchgear, it's glass. And if it's electronics, it's Audi. Those electronics include a new infotainment system with an 8-inch touchscreen, a 60-gigabyte hard-drive for media storage, 4G LTE and Wi-Fi hotspot connectivity, Apple CarPlay compatibility, and some great rear infotainment features that we will get to soon. Bentley calls the seats sumptuous armchairs and we agree with that assessment. The seats are wide enough for fatcat backsides, but comfortable and supportive to the point of cosseting. The Speed's diamond-pattern quilting is especially attractive. The driver's seat is a rather special place to be, but the backseat might even be better, especially in the Extended Wheelbase model. The rear seats are just as comfortable as the fronts and rear seat occupants get just as many if not more entertainment options as those up front. Opt for the $19,355 Entertainment Specification with Google Maps and you get the 20-speaker, 20-channel, 2,200-watt Naim audio system, veneered rear picnic tables that fold down from the front seatbacks, and a pair of 10.2-inch Samsung tablets that rise out of those seatbacks. These tablets allow rear seat passengers to control the car's climate and entertainment systems, surf the web, and gain access to thousands of Android apps. They are also removable, so you can take them in the house when your driver has dropped you off from a night at the symphony. Extended Wheelbase buyers can also opt for the $13,670 Comfort Specification that comes with two rear airline-style reclining seats, massage and ventilation functions for all four seats, comfort headrests with alcantara pads, and two loose bolsters. Another $12,670 will get you a long center console with twin deployable picnic tables. The fold-out table mechanism is a work of mechanical art. It is made up of 761 pieces, and it includes springs and dampers to make the movements as elegant as possible. The mechanism is so sturdy that the outer portions of the tables can hold close to 90 pounds. For a mere $10,970, you can get a refrigerated cooler between the seats. The bottle cooler with three crystal champagne flutes is the most appropriate for the Mulsanne, but you can also opt for a version that holds two water bottles and tumblers, and another to accommodates spirit bottles, crystal glasses, and a Bentley hip flask. All told, for $56,665, the price of a Lexus GS, you can have a backseat with a premium audio system, pop up entertainment tablets, extending legrests, airline-style fold-out tables, and a cooler. You can get most of those features (the rear screens aren't removable) for $18,600 in a Mercedes-Benz S-Class or $16,250 in the BMW 7-Series, but if you wanted one of those pedestrian cars you would have bought one, wouldn't you? Your damn assistant can settle for one of them. 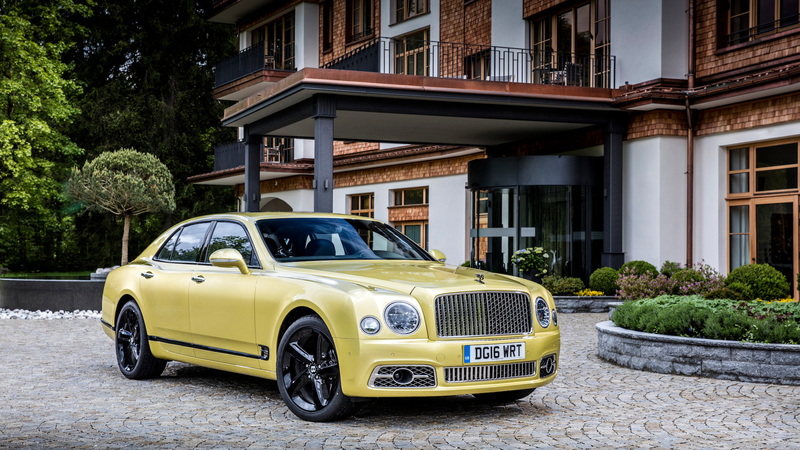 The Bentley Mulsanne starts at more than $305,000. The Mulsanne Speed adds another $30,000 to that total, and the Extended Wheelbase model tops $360,000. Bentley shared some facts and stats that at least start to justify those price tags. To wit: It takes 400 hours to build a Mulsanne, which is 20 times as long as the typical production car. Master metal workers, not robots, perform 5,800 individual welds. Bentley considers the Mulsanne's interior to be the best in the world, and spends 150 hours assembling it. The seats are stitched, shaped, and finished by hand, and if you order contrast stitching that takes another 37 hours to complete. The Mulsanne's paint is also exquisite. You won't find orange peel on vertical surfaces like you will with many of today's standard production cars. The paint is applied in layers to make sure it appears even. It is hand sprayed, lacquered, and polished by hand with lamb's wool for 12 hours to get the final, mirror-like finish. A total of 120 processes are employed along the way. On top of that, Bentley brazes the seams where the roof meets the rear fenders to make the body look like it's been carved from a single piece of metal. Efforts like these show Bentley knows quite a lot about building luxurious cars, and my time in the Mulsanne highlighted the car's immense power and unmatched refinement. Experiencing these traits firsthand helped me understand why a discerning buyer would want such an exquisite piece of machinery.